Sling safety matters. Carrying our children in a sling safely can be one of the most precious experiences we ever have as parents or caregivers. There really is something very special about the bond that builds from keeping your child close. However fantastic it may be, it must be done safely, for your baby’s health and your own. As parents of small babies and bigger ones, one of our greatest priorities is to keep our children safe. 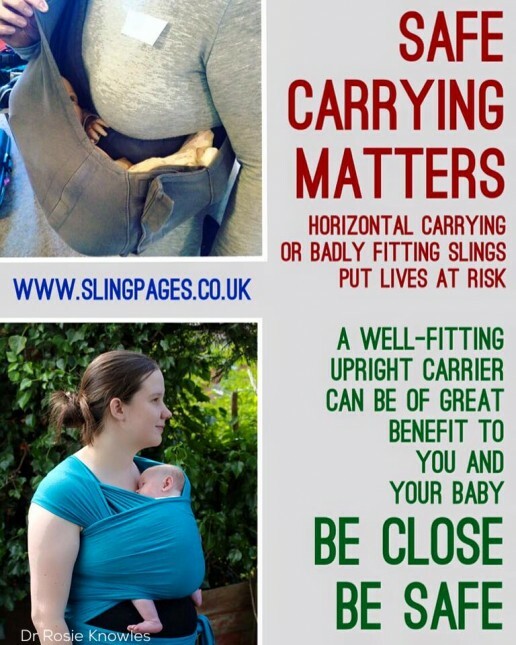 A good, correctly fitting sling can be a very helpful tool for this; keeping a child safe while daily life continues. This is becoming increasingly popular around the more developed world; a practice that has in fact been universal for thousands of years. Families that live in extended communities or “villages” are usually able to share well-honed, tried and tested knowledge down the generations and provide easily accessible advice and support. This kind of local support is much harder to come by in our more fragmented societies, which means we often turn to books or the internet to fill the gaps in our knowledge and provide us with reassurance we are doing it right. Unfortunately, sometimes these sources of information are out-of-date, incorrect or even dangerous, and can lead to problems with the use of any kind of baby equipment. Manufacturer instructions can be slow to be updated with new “best-practice” guidelines and YouTube videos not made by professionals can often be misleading and miss out important information. Many carriers on the market hold babies very low down and loose, which will allow young bodies with little muscle tone (especially during sleep) to slump and end up with nose and mouth pressed against fabric. This is risky. Very few manufacturers advise about monitoring baby’s temperature in baby carriers; which is important, as overheating is risky. Why bother with a sling at all if there are any risks? 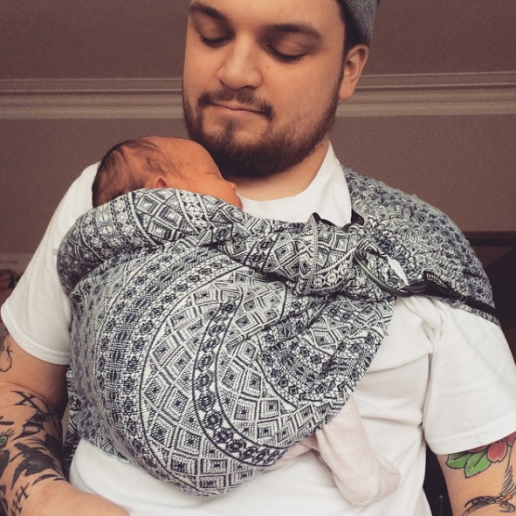 There are many benefits to using a sling with a very young baby; in fact. many hospitals use them in the practice known as “Kangaroo Care”, and there is much evidence to suggest this skin to skin contact between mother and newborn (especially premature babies) can confer great benefits to both. The baby gains assistance with their physiological regulation of breathing and heart rates, temperature control is improved, and the contact helps to establish breastfeeding and promote more rapid growth compared to babies who are not held as close for as long. Furthermore, the baby will feel more secure in their developing relationship with his caregiver, due to the time spent in close contact. The caregiver may find that he/she is able to bond with her baby, due to the increased release of oxytocin, and post-natal depression may be reduced. Being able to be “hands-free” can really make a difference to a family’s ability to get around with their new baby, keeping them active and engaging with normal life. The key is to know how to use the sling in a safe and secure way, just as you may practise learning to ride a bicycle, or drive a car. Familiarity and practice make perfect. All baby equipment should be used safely, and it is an unfortunate fact that sometimes things are not fit for purpose, or the instructions that come with equipment are inadequate. Babies should be able to breathe easily, be at a comfortable temperature, and held in positions that are healthy and beneficial for them. How can I ensure I am using my sling safely? 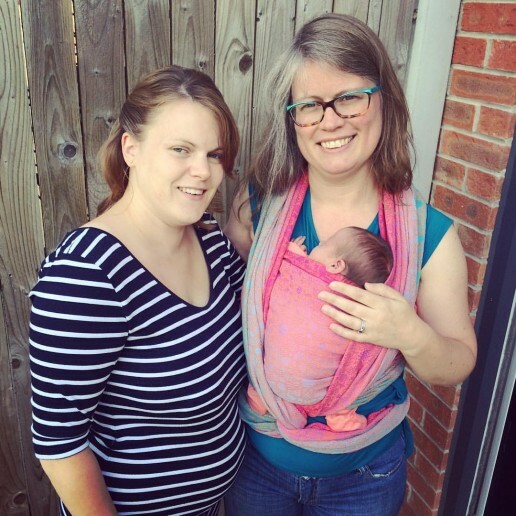 A good sling should mimic the natural, in-arms upright position for carrying babies, ensuring the caregiver can see and sense the baby at all times, and thus able to be quickly aware of and rapidly responsive to any changes. I see a lot of parents with newborn babies wanting to learn how to use a sling, and the photos and the position diagrams here are the first thing we look at. Babies grow in tucked positions, and after birth, they tend to maintain this gentle curve to their spines for several months due their lack of muscle tone or strength to their head and neck and upper torso. It is not till they are older that they have the strength to hold their spine in a straightened posture. It is not till they can crawl and stand and are beginning to walk that their muscles and ligaments hold the spine in the more adult S shape. While babies are young, holding them in their naturally adopted tucked positions is both comfortable for them and also more comfortable for you. As they grow and begin to develop their strength and clinging ability, their needs will change. Young babies who are seated in the “squat” position or the M shape (looks like a J shape from the side) will have a broader, more stable base to rest on than a narrow perch. This position, with the curve mainly at the base also helps to keep the chest flat against the parent’s body and thus in an expanded position for good airflow. 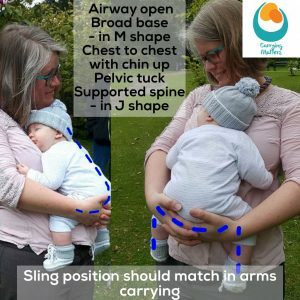 Babies under 3 to 4 months are most at risk of airway compromise when chin can sink onto their chests; so a good carrier will hold baby’s chest snugly against yours to keep the chest cavity uncurled and the chin off the chest. It is important to ensure no slumping and that there is no fabric over the face and there is a good air supply. Babies should be dressed appropriately to ensure they do not get too warm; people are often surprised how quickly everyone can warm up when in close contact. Please do not use thick, furry or padded snowsuits and dress down. You can always add more layers over the top. ABC is the basic first-aid mnemonic, which can be adapted for safe sling use. BODY POSITION is important to protect the airway as well. 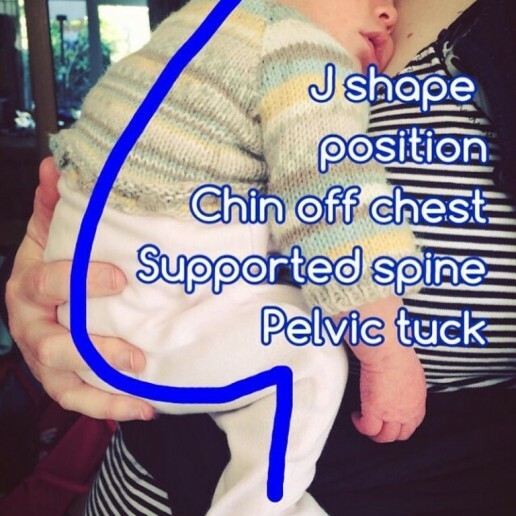 The upper body should be supported against parent’s chest, to ensure no slumping (this is why carriers should be tight, to make sure that babies do not roll up into a ball). The pelvic tuck into the M shape with knees higher than bottom will help support baby’s back as well as being very comfortable. The back of the head should be supported where possible to avoid backwards lolling. The pelvic tilt and using a rolled muslin cushion can be helpful if babies resist head support. See the diagrams above for the correct shaping. COMFORT comes last – I would rather see a child in an uncomfortable carrier that was safe, than fast asleep slumped into a tight ball or folded over in a cradle carry, however comfortable it is. However, you and your child are likely to enjoy and appreciate a carrier that is pleasant to use, fits well and does not cause back pain. 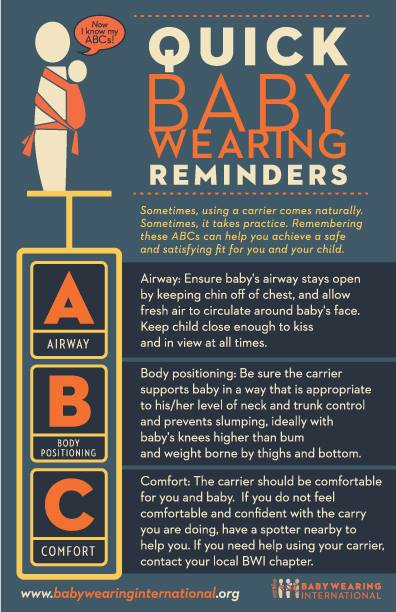 Here is some advice about how to choose a carrier. Comfort also covers the baby’s temperature; too hot is a problem, so please layer your baby carefully and do not over-dress them. In summary, the safest position is an upright one that meets the TICKS guidelines – Tight, In View, Close enough to Kiss, Keep Chin off the Chest, Supported Back. I would never recommend any kind of lying- down position in a carrier, especially where the back of the head is bent forwards to compress the airway and a child is thus not able move its head freely to clear any blockage. Bag slings, ill-fitting pouch slings and other slings used badly can be risky. 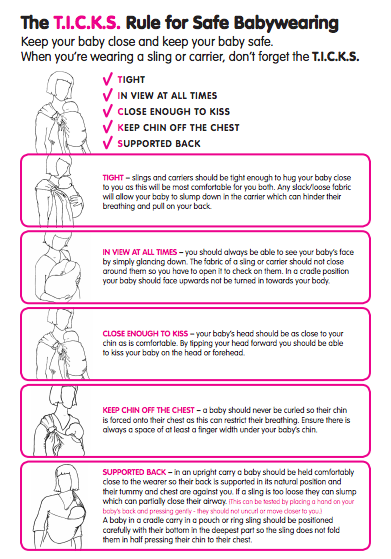 Breastfeeding is usually safest done in upright positions for this reason, and a child who falls asleep feeding in a sling should always, always be brought back into this safe upright position, to protect the airway. Babies should never be left to sleep in a cradled position inside a sling; this can be dangerous. What about older babies beyond the early weeks and months when they are developing more control over their bodies? As babies grow, their needs and abilities change. A baby who can maintain their own airway independently will expect more freedom and will show you this with wriggling and turning. Their wild jerky movements are how they practice muscle control and learn coordination. Movement is important, babies should be given the opportunity to explore their bodies whenever possible. Parents and carers will need to find a happy balance between the need for safe and comfortable transportation, a place to sleep or feed, and their baby’s need to move. It’s worth being aware that prolonged, unchanged positioning isn’t good for anyone and even adults are being encouraged to move every 45 minutes. Children’s bodies are still growing! Try to change positions, try in arms carrying, swap with other carers, use a buggy, to give children a variety of experiences and positions. To ensure no slumping, position your child correctly against your body, chest well against yours, and bring the carrier over your baby as you hold them. This video will help you to ensure no slump. A child whose bottom and legs are well supported from knee to knee in a “spread squat” or “M position” is in a more stable position and will be less likely to fold up or slump over. Always familiarise yourself with your carrier before you use it for the first time. Ensure you have a good idea how to use it. Some people like to practice with a teddy bear near a bed and with a mirror to see what is happening. Check your baby is willing to be carried. The only “unsafe” carry is one with an unwilling baby. If baby seems unkeen, can you establish why? For example, is he hungry? Is she wet or dirty? Does he have reflux or does he find certain positions uncomfortable? Does she want to do something else? Is he too hot or cold? Is she in pain? If he or she cries in a sling, read here about some of the many other reasons a baby may express distress. Ensure appropriate clothing – the sling may add additional warmth, so layering is a good idea. In cold weather there is a temptation to wrap up extra warm but this needs to be done with care. Too-warm babies are less likely to wake if their breathing slows. Don't be tempted to over-dress!! You can always add more layers over the top if babies really are cold. Many people find baby leggings, gloves on strings, well fitting hats and tie-on warm booties to be especially helpful in the chill. Thin layering is key. Read more about the risks of snowsuits here. Don’t forget to ensure your baby doesn’t get too hot in the summer; protect your baby from sunburn and to keep well hydrated in warm weather. An useful tip, if you dress your baby in a bodysuit with feet, is to choose a larger size than for ordinary wear, as the fabric will ride up a little with the sling and may squash tiny toes. It is important to be aware of your child at all times; if you feel something is different, check! Some people like to carry a small pocket mirror so they can check on children riding on the back. 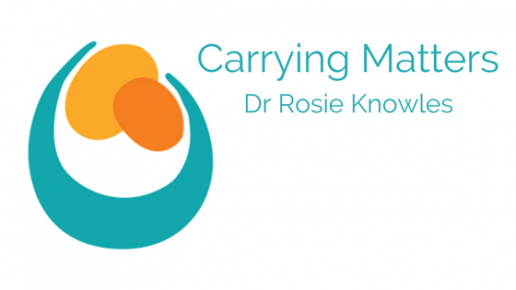 It is wise to consider what physical activity you wish to do while babywearing; will it hinder your awareness of your child in the sling or hamper your ability to deal with any problems? Your baby will be at a height in the sling and may be able to reach for unexpected items – awareness and attention is vital. Be very cautious when engaging in any form of exercise or dance with your baby in the carrier; many manufacturers do not recommend this, and there are risks with young babies and untrained class leaders. Read more about slings and exercise here. Your sling is NOT a substitute for a car seat, and you should not sleep while carrying your baby. Do not carry your baby facing out in a carrier before 3-4months, and avoid letting them sleep facing out. Be responsive to their needs and turn them back to face you when showing signs of weariness. Choose a carrier that will be comfortable for their spines. There are many, many sling communities in the UK, sling consultants like myself who offer one to one sessions where you can look through the options and practice using a carrier safely, sling libraries with trained peer supporters where you can try out slings and get some advice, and sociable sling meets that will serve a “village” purpose for parents to share their growing knowledge/personal journeys and offer support. Don’t rely on books/pamphlets/the internet – be armed with education and take advantage of the experience you will find in your local resources. If you are unsure, do find your local sling professional at the Sling Pages – we are always happy to help.